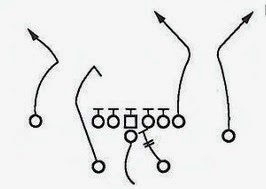 Move extra point to the 40 yard line – the team scoring the touchdown has choice to kick it from there, or forego the extra point and have the opposing team be given the ball on their own 20. If they decide to go for the extra point and miss, then the opposing team gets the ball at the spot of the kick. The option to go for 2 points would also look a lot more attractive. This would make the game more exciting and add more strategy to what now is a perfunctory act. But what about the kickoff after a team makes a field goal? The opposing team should get the ball at the spot of the kick whether the FG is made or not. This would discourage long field goals and encourage team to go for it on 4th down more. For field goal attempts inside the 20 yard line; you could either go with keeping the rule I describe above the same, or if you wanted to not overly award teams choosing to kick field goals, you could say that a close in kick will result in the opposition getting the ball on their own 20 yard line. Make all FG attempts from the 40 yard line - no matter how close the offense is to the goal line. This would also encourage teams to go for it on 4th down, as well as making a team think twice about running the clock down at the end of the game when they are driving for a game tying FG.